Peer instruction is a powerful, evidence-based instructional strategy where the instructor poses a conceptually-challenging multiple-choice question, the students vote using “clickers”, discuss their thinking with their neighbors, vote again (depending on the type of question asked) and then participate in a class-wide discussion. Our attitudes or “mindset” toward our own learning determines our behavior (and success). One of the benefits of using clickers to facilitate peer instruction is the hardware and software lets you track who clicked and what they clicked because every i>clicker (that’s what we use at UC San Diego and other audience response systems can do this, too) has a unique ID. After it’s set up and talking to your learning management system, when a student clicks, you can track it student-by-student and click-by-click. Why would you want to track it, anyway? The short answer is, so students can accumulate points that contribute to their course grade. The question is, what do they get points for: for clicking anything (participation), for getting the questions correct (performance), or a combination? It is generally recommended that students receive PARTICIPATION points for peer instruction questions. Assigning points for PERFORMANCE, that is, getting the questions correct, has been shown to hinder conversations (here’s an example in Physics) because students worry about “getting it right” rather than recognizing what they know/believe about the concept. Plus, many good peer instruction questions have more than one correct answer and the goal is getting students to talk about one of the choices. Yes, I can learn this is. It might not be easy but I can do it. I’m not good at this stuff. This course is going to hard. And some of your students will have no mindset about your course. They’ve never even heard of transpolymerization or intersectionality or traxoline, let alone whether or not they think they can learn it. Because of the success a growth mindset can bring, I say we do everything we can to spark and foster a growth mindset in our students and make them confident they can learn. And that confidence is fragile: it only takes being shut down by your professor once for asking a question in class to never ask another question in class. It only takes one hurtful comment on an essay to never stray beyond 5 paragraphs again. It only takes once getting the clicker questions wrong and receiving nothing to sit next to Mr. Smarty-pants next time and just do what he does. 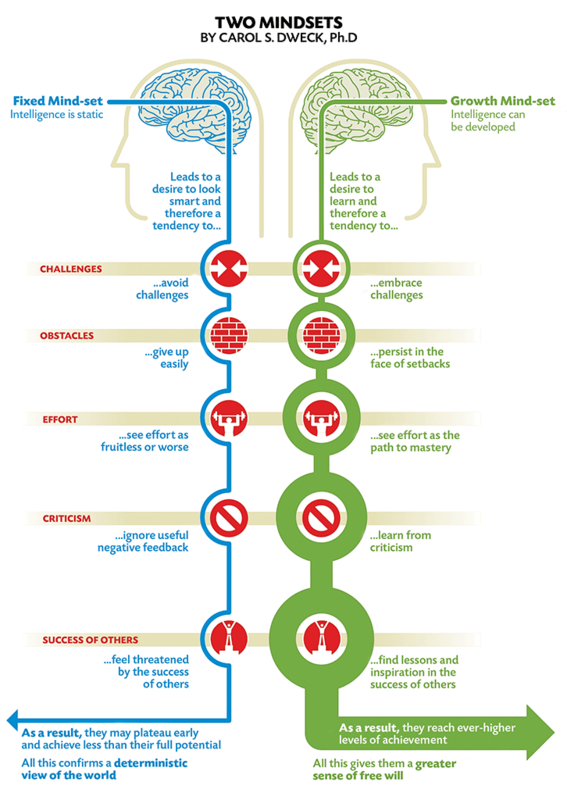 Fostering a growth mindset is hard but you can do it* by how you create a supportive learning environment in class, how you respect all your students, how you show your appreciation for every contribution a student makes to class, and how you reward your students for participating in peer instruction. *Oooo, growth mindset about growth mindset! Option 1: students receive 1 point per class if they answer almost all of the questions (“almost all” is good practice because you don’t want a student to get zero if they happen to miss clicking once during the class.) You specify the “almost all” threshold in the i>clicker settings. Option 2: students receive 1 point every time they click. Personally, I like Option 2 because on really busy days where students vote and revote on several peer instruction questions, they’re rewarded with a lot of points, compared to the slower days where they only had to answer 1 peer instruction question. If you’re going to give points, you need to build it into the syllabus — it’s got to be worth something. I’ve seen instructors assign as little as 2% for peer instruction (too low, in my opinion) and as high as 20% when participation in the clicker-driven class discussion was really important. If you’re not sure, 5-10% is a good range, but call it “class participation” rather than “clicker points” to give yourself some flexibility to do other collaborative activities in class, too. To receive full marks on this component of the class, you only need to participate 80% [you set this threshold in your syllabus] of the time. That is, you can miss an occasional click and still receive full marks. At the end of the course, you’ll have to do a little calculation to figure out their clicker scores but that’s a small price to pay for removing all the stress and anxiety students might feel. Support a growth mindset in your students with participation points for peer instruction to reward them for practicing thinking in expert-like ways. There are plenty of other components of the course to assess their performance. Let peer instruction be about practice, formative feedback, and their realization they CAN do this, after all. Working with a diverse group? Try a card sort.